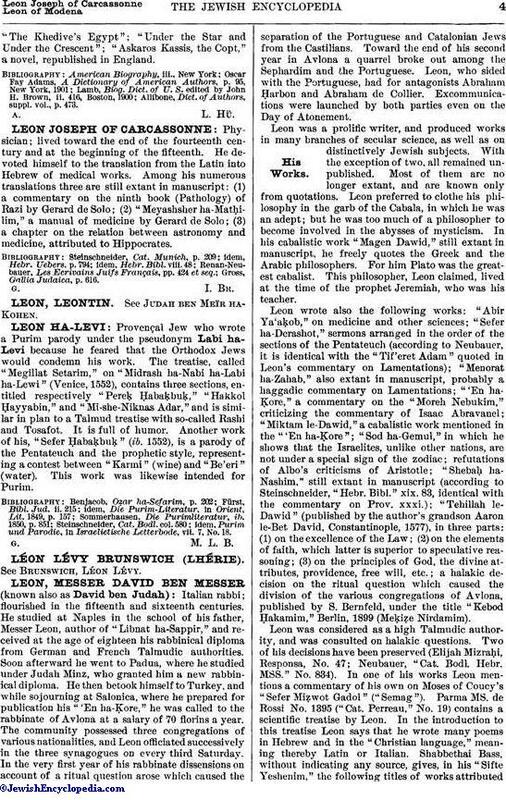 Provençal Jew who wrote a Purim parody under the pseudonym Labi ha-Levi because he feared that the Orthodox Jews would condemn his work. The treatise, called "Megillat Setarim," on "Midrash ha-Nabi ha-Labi ha-Lewi" (Venice, 1552), contains three sections, entitled respectively "Pereḳ Ḥabaḳbuḳ," "Hakkol Ḥayyabin," and "Mi-she-Niknas Adar," and is similar in plan to a Talmud treatise with so-called Rashi and Tosafot. It is full of humor. Another work of his, "Sefer Ḥabaḳbuḳ" (ib. 1552), is a parody of the Pentateuch and the prophetic style, representing a contest between "Karmi" (wine) and "Be'eri" (water). This work was likewise intended for Purim. idem, Purim und Parodie, in Israelietische Letterbode, vii. 7, No. 18.